Door Silencer – Only $6.99! The door silencer allows you to open or close any interior door silently! Prevents toddlers from getting locked in/or locking you out of a room by not allowing the latch to engage. Made of durable designer fabric and stretchy elastic straps. Conveniently fits all door shapes and sizes (including lever or french handles). Thick enough to keep the door tightly shut. Comes in beautiful fabrics to blend with any style or decor. 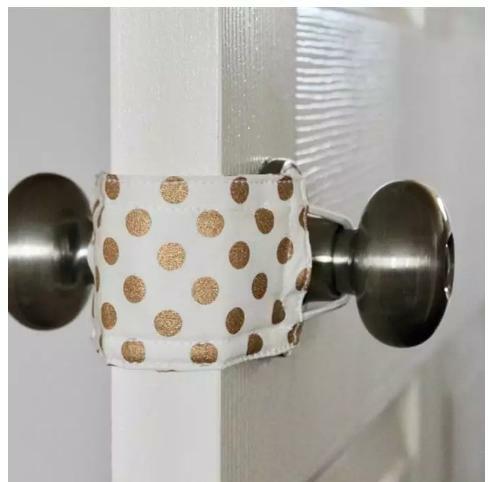 Hangs on the doorknob when not in use. Easily slips into place when needed. Never have to hunt and search for your sleep saving secret weapon!